April of 2006 was a dire time for the state of American democracy. In just five-and-a half years, George W. Bush had stolen the 2000 election, ignored intelligence warnings and presided over one of the biggest national security failures in U.S. history, rammed the Patriot Act through Congress, manipulated public fear to lie us into the invasion of Iraq, eroded the wall between church and state, squandered the Clinton budget surpluses on tax cuts for millionaires and lavish subsidies to defense contractors, littered the courts with right-wing judges, established the worst environmental record in decades, and allowed a major American city to drown through sheer incompetence. Worse yet, there was no end in sight. Though some pundits thought the Democrats might re-take Congress that fall—and the White House two years hence—it was far from guaranteed. The Republicans had controlled Congress with ironclad discipline for 11 years and had made gains in the prior two elections despite having no significant accomplishments to campaign on, and to that point in his life, George W. Bush was unfamiliar with the notion of accountability, having glided from one failure to another while increasing his job stature, like the Peter Principle poster boy he was. to follow the event’s unspoken protocol of playing nice. Scattered partisan jabs were acceptable, but the jokes were generally harmless fun, and the event on one level was intended to be a salute to the watchdog role of the American media. Enter Stephen Colbert, keynote speaker and satiric stealth missile. At the time, “The Colbert Report” was new. People didn’t know what to expect, which offered Colbert a wide berth. What followed was an all-out assault on the presidency of George W. Bush. 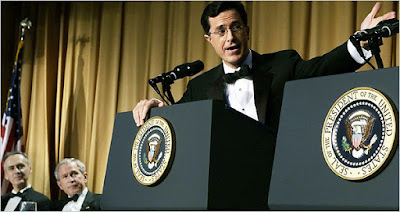 As the president looked on just to his right, Colbert targeted Bush’s colossal policy failures, Nixonesque ethics, and faith-based imperviousness to inconvenient facts. As an added bonus, Colbert knocked Bush’s enablers: the supine mainstream media who had served Bush’s interests by failing the U.S. public on one big story after another and the one-third of Americans who implausibly continued to support the president (“There’s still some liquid in that glass, but I wouldn’t drink it…the last third is usually backwash”). 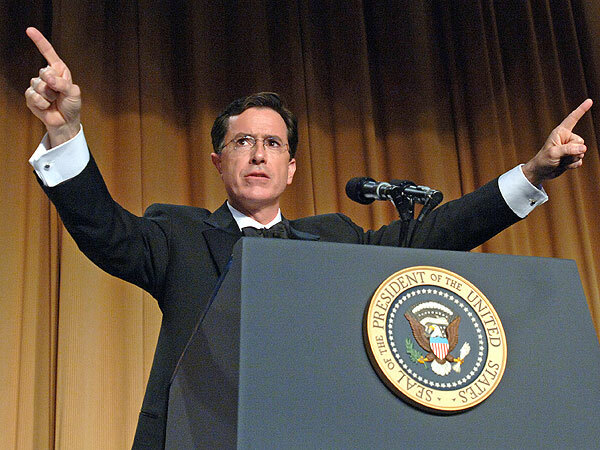 Though the scathing roast below quieted the audience of entitled D.C. insiders and received little major media coverage after, video of the performance went viral and raised the profile of Stephen Colbert, who would go on to snare the coveted Late Show post many years later, a delayed karmic payout for this brave act of public service.